Josef “Pips” Priller was born on 27 July 1915 at Ingolstadt in Bayern. In 1935, Fahnenjunker Priller was serving in Infanterieregiment 19. Oberfähnrich Priller transferred to the Luftwaffe and began his flying training at Salzwedel in October 1936. On 1 April 1937, Leutnant Priller was posted to I./JG 135.  In November 1938 the unit was redesignated I./JG 233 and again on 1 May 1939 to I./JG 51. In July 1939, he was serving with I./JG 71 which was to be redesignated II./JG 51 in October 1939. On 1 October 1939, Priller was appointed Staffelkapitän of 6./JG 51. He gained his first victories on 28 May 1940 over Dunkirk in aerial combat with RAF fighters. He claimed six victories during the French campaign, including his 6th on 25 June, when he shot down a RAF Spitfire fighter near Desvres. By the end of August his victory total stood at 15. On 17 October, Oberleutnant Priller claimed his 20th victory resulting in the award of the Ritterkreuz on 19 October. He claimed at least fourteen victories in the Battle of Britain. On 20 November 1940, Priller was transferred as Staffelkapitän to 1./JG 26, succeeding Oberleutnant Eberhard Henrici (7 victories) who had been lost in aerial combat over the Channel three days previously. Despite much combat with the British, Priller was unable to add to his score before the end of the year. That winter, JG 26 was withdrawn from the Channel front back to Germany for a rest. On his return to the Channel Priller enjoyed a remarkable run of victories between 16 June and 11 July 1941 shooting down 19 RAF aircraft, including 17 Spitfire fighters, to bring his victory total to 39. On 14 July, Priller shot down his 40th victim. He was awarded the Eichenlaub (Nr 28) on 19 October for 41 victories. Hauptmann Priller became Gruppenkommandeur of III./JG 26 on 6 December 1941. By the end of 1941 Priller’s score stood at 58. He recorded his 60th victory on 27 March 1942 and his 70th victory on 5 May. Gruppenkommandeur of III./JG 26 Hptm. 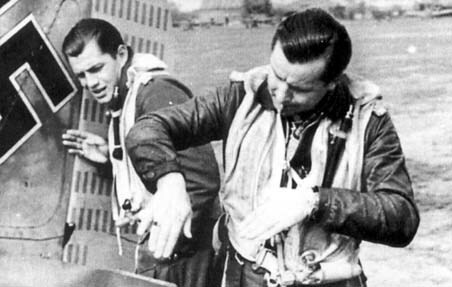 Josef Priller (right) explaining a dogfight to his wingmann Lt. Johann Aistleitner. On the rudder of Priller`s Fw 190 A-2 (W.Nr. 5310) "<< + I" are seventy-three victory bars. June, 1942. By the end of 1942 Priller had 81 confirmed victories to his tally. 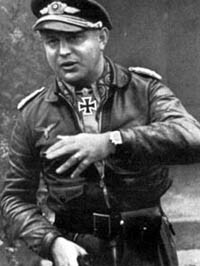 On 11 January 1943, Priller became Kommodore of JG 26, replacing Major Gerhard Schöpfel (45 victories, RK) who was taking up a staff role. He was awarded the Schwertern (Nr 73) on 2 July 1944. Oberstleutnant Priller brought up his 100th victory on 18 July 1944 when he brought down a USAAF B-24 four-engine bomber. On 1 January 1945, Priller led JG 26 and III./JG 54 in the attack on the Allied airfields, codenamed Operation Bodenplatte, at Brussels-Evére and Brussels-Grimbergen. On 28 January, Priller was appointed Inspekteur der Jagdflieger Ost, a position that required he cease operational flying and which he held until the end of the war. Post-war “Pips” Priller managed the family brewery business. He died on 20 May 1961 at Böbing in Oberbayern following a heart attack. Josef “Pips” Priller flew 1,307 combat missions to achieve 101 victories. All his victories were recorded over the Western Front and include 11 four-engine bombers. He was the most succesful pilot in battles with Spitfires claiming at least 68 of them.